Francois Auguste Rene Rodin, known as Auguste Rodin was born November 12, 1840 in Paris to a working class family. He began drawing when he was about 10 years old. He was mostly self-educated. When he was 14, he entered the Petite Ecole, a school for artists and mathematicians. He attended this school until he was 17. During his time at the school, he studied under Horace Lecoq de Boisbaudran. This teacher had a unique perspective in teaching. He believed in developing his student’s personality so that the student observed the world with their own eyes and drew from their memories. Even later in his life, Rodin was appreciative of this teacher’s approach. Rodin submitted a clay sculpture to the Grand Ecole in 1857 in an attempt to gain entry to the school. He made two additional attempts at admission and was denied both times. The school’s admissions standards weren’t considered especially rigorous and it is speculated that Rodin’s failures to gain acceptance were due to a difference in the artistic tastes of the admissions officials and Rodin’s style. Rodin was trained in a lighter, 18th century sculptural style while the judges preferred a more neoclassical style of work. Rodin left the Petite Ecole in 1857 and went on to earn a living as a craftsman and ornamentor. Over the next twenty years, he produced decorative objects and architectural embellishments. Rodin had a sister, named Maria, who died of peritonitis in 1862. Rodin took her death hard and harbored a great deal of guilt because he had introduced her to a man who was unfaithful to her. Disillusioned, Rodin turned his back on art and joined a Catholic order, the Congregation of the Blessed Sacrament. Saint Peter Julian Eymard, the founder and leader of the order, encouraged Rodin to continue with his sculpture. He recognized the artist’s talent and speculated that Rodin was not suited for the life of a religious order. Rodin went back to his work as a decorator and began studying with Antoine Louis Barye, an animal sculptor. Barye’s attention to detail in the musculature of animals in motion strongly influenced Rodin. These influences can be seen in much of Rodin’s later works. In 1864, Rodin began living with a woman, Rose Beuret. They had a son who was born in 1866. That same year, Rodin submitted a sculpture for exhibition and joined the studio of Albert Ernest Carrier-Belleuse, where he worked as chief assistant and produced roof decorations and stairway embellishments. Rodin worked for Carrier-Belleuse until 1870. 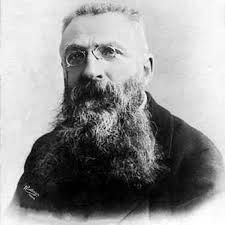 Rodin was called to serve in the National Guard when the Franco-Prussian war broke out. Rodin was nearsighted; a fact that shortened his military service. After Rodin’s military service, Carrier-Belleuse invited Rodin to accompany him to Belgium and continue working as a decorator. Rodin agreed and planned to spend a few months in Belgium. His plans changed and he ended up staying in Belgium for six years. Rodin gained experience as an artist and craftsman through his decorator job, yet no one had seen his sculptures. He could not afford the materials to have his work cast in bronze. It was during his time in Brussels that his relationship with Carrier-Belleuse deteriorated. He found employment with other studios and displayed some of his works at salons in Brussels. Auguste Rodin was a French sculptor who became one of the most influential sculptors of the modern era. Trained in classical technique, Rodin developed a style and a body of work that transformed sculpture for generations. Although he found classical sculptural techniques stale and boring, he didn’t start his career with the intent of being a rebel. He wanted academic recognition, yet the best known of his works were met with controversy and criticism. The poses of his subjects were considered too casual, his work was disrespectful in its lack of heroic theme, his forms too real for conventional tastes. The criticism often cut Rodin deeply, but he did not compromise his artistic vision in order to fit in with the establishment. Much of Rodin’s work represents the growth of democracy, where the masses of humanity matter as much as the elite. This paradigm shift toward a more democratic approach toward humanity led to Rodin’s work gaining greater acceptance with both governments that commissioned his works and private collectors. At the turn of the century, Rodin’s work was highly sought after by art collectors. Rodin was extremely prolific throughout his career, producing over 13,000 works of art and writings. During his career, Rodin developed a process to maximize his creativity. He created clay sculptures which were re-sculpted in larger form by his assistants and later cast in plaster or bronze or carved from marble. This multi-step approach to creating art allowed Rodin to create many more pieces than he could if he worked alone. It also explains why there are so many sizes of the same piece. He took advantage of 19th century technology and business practices, building a network of government commissions, art curators, private collectors and other artists. He used this network to promote his work and expanded the market for his work beyond European borders into America. Today, Rodin’s work consists of some of the most recognized sculptures in the world and some of the most highly desired by collectors. Even the technological world has recognized his genius, with search engine giant Google creating a Google Doodle in honor of the artist’s birthday in November 2012. Rodin began drawing when he was about 10 years old. Even though he was enrolled in art school at a young age, he was mostly self-taught. Rodin’s teacher had a unique approach toward developing his student’s talents. He believed in allowing his students to develop their personalities and to view the world through their own eyes. This distinctive appoach to education was most likely instrumental in Rodin developing such a radical approach to sculpture. Rodin’s education in sculpture followed traditional styles, yet the artist developed an unconventional approach to the method and style of his work. The break from classical sculptural tradition has made Rodin’s work universally recognizable throughout the world. Business people can learn much from Rodin’s example. He received an unconventional education that influenced him his entire life. He learned his craft and applied it diligently while adding his own distictive voice. Modern business requires both traditional knowledge and creative thinking to solve challenging problems in a tight economy. Although many businesses are struggling, there are those that are growing. Those that are growing are the ones that have embraced the challenges of the changing economy and responded in unconventional ways. Some companies have initiated job sharing, others are using flexible scheduling and work from home options to cut costs and maximize profits. Even the federal government is opting for the telework option. Many federal employees are telecommuting from home offices. This option allows the government to save money on overhead costs such as office space, utility expenses and office equipment. The employees also benefit in that home office expenses are tax deductable. Creative business men and woman are blending traditional thinking with new processes and innovating the way their companies do business. When companies embrace the change, it is a win for everyone. Rodin produced a massive body of work over his lifetime. One of the ways he was able to create so many pieces of art was through his use of the technology available to him. The concept of mass production and multi-step production was a technological innovation that led to the proliferation of consumer goods such as automobiles. Rodin applied this same production technology to his art. He created the initial sculpture in clay and then turned the work over to a team of talented assistants. They, in turn, created larger sculptures of Rodin’s original piece. The final works were then cast in plaster or bronze or sculpted in marble. By applying these concepts to his own work, Rodin was able to produce a much larger body of work than he could have if he had worked alone. Technology has changed the face of work in the modern world just as it did during Rodin’s time. Modern technology allows people instant access to information and communication like never before. The digital age is a double-edged sword for many business men and women. Although technology has improved communication and data management, it also has the potential to be a huge distraction in the workplace. Social networking sites such as Facebook and Twitter, instant, constant news updates and sports scores, text and instant messaging, online shopping and sniping auctions on Ebay offer a wide array of time wasting opportunity for employees. The wise business person applies Rodin’s lessons of using technology to boost productivity through the judicious application of said technology. E-mail has become a standard business tool in the past decade. Even very small businesses use it for communicating with employees. More recent advances in technology and business practices include document sharing, cloud storage and telecommuting. As technology changes and reshapes the business world, businessmen and women must be flexible and adapt to these changes. The digital age allows people the means and opportunity to stay ‘plugged in’ to their work 24 hours a day. Connectivity should not be confused with productivity, however. Rodin understood the value of networking. He built networks of private commissions, government sponsored commissions, gallery curators, private collections and other artists. He used his networks to win commissions for public and private exhibits and collections. One of the best examples of Rodin’s skill with networking can be seen when he was trying to break into the American art markets. Rodin’s work was not well known in the United States in the late 19th century. He became friends with Sarah Tyson Hallowell, a curator for an art useum in Chicago. Hallowell became instrumental in Rodin’s commercial success in the United States. She introduced the artist to wealthy, influential art collectors and played a key role in helping him get some of his work accepted into an exhibition of French artists at the 1893 Chicago Worlds Fair. Without Hallowell’s connections, Rodin would have had a much harder time reaching the people who were in a position to support his career. Modern businessmen and women are advised to build networks to further their careers. It is not enough to build a network; the network must also be nurtured and managed. Networking is a critical business skill. Part friendship and part mentorship, networking is a delicate balance of give and take. When networking, it is important to be friendly and approachable yet remain professional. There are times when someone in your network needs something from you, an introduction, a contact or maybe even a recommendation. There are times when you will need the same from the members of your network. Use your networks wisely and if someone gives you information that advances your career, remember to thank that person. Rodin frequently found himself at odds with committees that hired him to create artwork for specific projects. He had a very strong artistic viewpoint that often conflicted with traditional methods. A good example of this can be seen in the commission of the Burghers of Calais. This work was to be a memorial commemorating several leading citizens of the town of Calais who offered their lives for the citizenry during the Siege that occurred there. Rodin’s vision for the piece had the work displayed at ground level, with a circular path inviting the viewer to walk around the sculpture. The viewer was expected to interact with each figure, experiencing the emotions of the figures as they headed for their doom. The committee that commissioned the work wanted a more traditional approach to both the content and the display of the work. Initially, the Burghers of Calais was displayed on a pedestal and fenced off, separating the viewer from the work and forcing the viewer to look up at the figures. The committee also envisioned the work as an allegory, with the emphasis placed on the eldest of the Burghers. Rodin took a more visceral approach to the work, depicting the conflicting emotions of each man as they sacrificed themselves for the the sake of their city. The committee was not pleased with Rodin’s interpretation of the event and wanted the artist to change the sculpture. Rodin refused, threatening to quit the project rather than compromise his artistic integrity. The committee relented and Rodin completed the project. The sculpture was installed in the traditional method of pedestal mount behind an ornamental iron fence. The Burghers of Calais was damaged in World War I and then again in storage. After the sculpture was removed from storage, it was displayed as Rodin wanted. Today, it is one of his best known and most loved works. It is an unfortunate factor of modern business life that not all practices are ethically pure or completely honest. Business leaders expect loyalty, honesty and integrity from employees at all levels of business. Business men and women need to be aware of the ethics policies of the companies they work for. They need to set the example for the employees they supervise. It does not matter what business you are in; sooner or later, you will find yourself in a position where you have to make the decision to do what you know is right even if doing so may endanger your job. Rodin understood this principle. He was expected to compromise his artistic integrity to fit someone else’s asthetic. Rodin refused, choosing resignation over compromise. Integrity in business is a key component to success. No one wants to do business with a company or a person that is dishonest in their dealings. Even the illusion of dishonesty has the potential to damage careers. It is much harder to restore a reputation than to maintain it. Consider the companies that were effected by the Wall Street collapse and government bailouts of 2008. There was a strong public perception that many of the businesses that received government assistance were being rewarded for poor management and dishonesty at public expense. Rodin treated each piece of his work, no matter how small, as if it were the most important piece he made. He often created what he called fragments, small sculptures that were studies of body parts, separate from a unified sculpture of an entire human figure. Artists use these fragments as exercises to perfect their technique and hone their skill. Prior to Rodin, classical sculptural tradition rarely treated these pieces as separate works of art in their own right. Rodin broke with tradition, treating his fragments as individual pieces of art, highly desirable and worthy of display separate from a full human form. Rodin took his treatment of fragments further, blending them together to create new forms and figures. These blended fragments were often out of proportion and logic suggests that they should not work together, yet Rodin managed to blend them into a cohesive unit. In modern business, large projects are often broken down into smaller components and shared with members of a team. If the project is large and complex with many team members, it is often easy to forget that each piece of the project is important. Business leaders need to remember Rodin’s example and treat each assignment, each project as if it were the most important part of the bigger picture. They need to stay engaged with the project, no matter how insignificant their role may seem. Think of a business project, such as launching a new product, as the production of a television show. There is a great deal of work that occurs behind the scenes to bring a television show to air. A team of writers and producers brainstorm story ideas and the writers produce a script. The actors and director use the script to act out the story and bring it to life. Cameramen and sound engineers capture the action and refine it in a studio. An edit team works with the director to blend scenes into a strong, cohesive and logical plot. A marketing team sells advertisement time to companies that have products they want to sell to underwrite the costs of producing the TV show. If all goes well, the final project is a television show that attracts a large audience week after week. Business projects work the same way in that there is a great deal of work that goes on behind the scenes. When a company launches a new product, the CEO and the spokesperson are the people who are the ‘face’ of the product but that product could not have been introduced to market if not for the teams of engineers, designers, artists, writers, researchers, accountants, attorneys and clerical support staff. Each of these positions played an important role in bringing the new product to market, yet most people will never know the names of the people who filled these roles. It is up to the business leaders to help their employees understand the importance of their work and the roles they play in the success of the project. Rodin understood this principle and applied it to his own work. Business leaders would do well to follow his example.